If you are tired of wearing loose-fitting dentures, visit our office for dental implants. As a cosmetic dentist, we can give you implants immediately after you have lost a tooth. We can also help if you have started wearing dentures but feel that they are no longer the right solution for you. We find that many people get dentures after tooth loss simply because they hear about them and not because they are the best option for their lifestyle. While modern dentures look natural and fit better than they used to, dentures are still a removable prosthetic. Because they are designed to come out, they will never have the level of security that a natural tooth does. This leads to many people feeling self-conscious about their teeth and worried about social activities such as meeting friends for dinner. If you have found yourself in this type of situation, it is time to consider a better alternative. This is where we can help you. When you come to our cosmetic dentist office, Peter T. Smrecek Jr. DDS Inc. can examine you and discuss the many benefits of dental implants. The main reason that implants are more secure than dentures is that we surgically place dental implants in the jaw. While we secure dentures and dental bridges on the outside of the gums, we place implants under them and secure them to the jawbone. The implant itself consists of titanium, a unique metal that the body treats like natural matter. 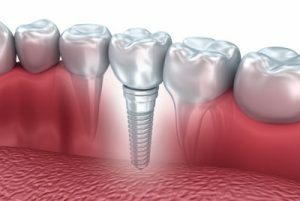 This means that the implant and patient’s jawbone will fuse together through the process of osseointegration. As a result, the jawbone provides the same level of stability to the implant as it does to the other natural teeth. With such stability, the patient can eat all of his or her favorite foods exactly the way that he or she wants. For example, the patient can bite into a crunchy green apple without worrying about any teeth coming loose. With dentures, the patient might not be as confident. Implants make it possible to enjoy some of the simple pleasures in life that might not be possible when wearing dentures. As a cosmetic dentist, we also recommend dental implants for anyone with an active lifestyle. If, for example, you are a runner, then dentures are not an ideal solution for you. Any type of high-impact activity like this might be difficult with dentures, not because you need your teeth, but because there is always a risk that they could come loose. Since dental implants are secured to your jawbone, there is no risk of them coming loose or falling out, regardless of the activity. Another benefit of implants is that they look more natural than a set of dentures. Even though dentures look better than they used to, the replacement teeth are secured to a gum-looking base. Implants are placed individually, which allows for greater levels of customization and a more natural appearance. « Welcome to Peter T. Smrecek Jr. DDS Inc.